If Wichita public school teachers seem to be unhappy with their pay, there’s a reason why. 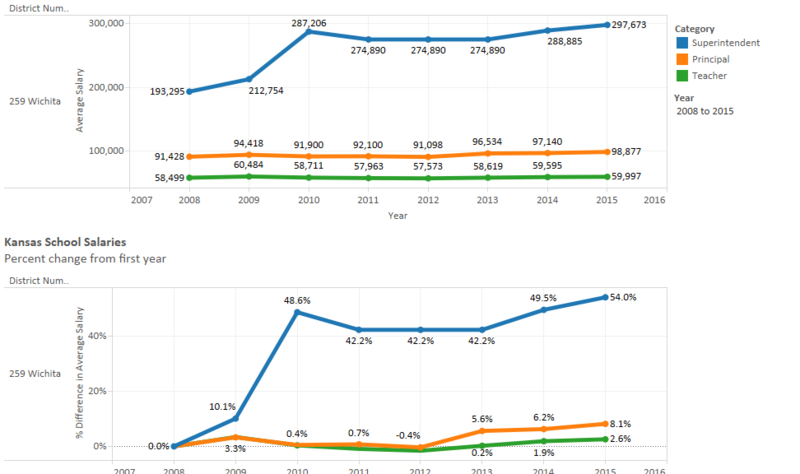 The following charts show the average salaries for three classes of employees as well as the change over time. The increase in principal salaries is three times that of teacher salaries. Citizens may want to keep this in mind when the district says that it is doing everything it can to direct resources into the classroom. Teachers may want to question why they pay dues to United Teachers of Wichita — their union — when they don’t get better representation than this. To access an interactive visualization of school salaries for all districts in the state, click here. Wichita teacher contract: For union members only? I don’t know why the Wichita teachers union would promote the contract as an exclusive benefit. It is a public document. You may read it here. Critics of public schools usually explain that they’re not faulting individual teachers. Instead, they target their criticism at the teachers union, bureaucratic school administration, or “the system” in general. So when we observe the actions of teachers, we’re correct to wonder if they’re acting as citizens, or as teachers representing their school districts, or as union members, or in some other role. This issue is important when we take notice of the actions of teachers at a recent meeting of the South-Central Kansas Legislative Delegation in Wichita. This salty language inspired by political conflict: Is that Judy Loganbill citizen, teacher of young children, or union member speaking? 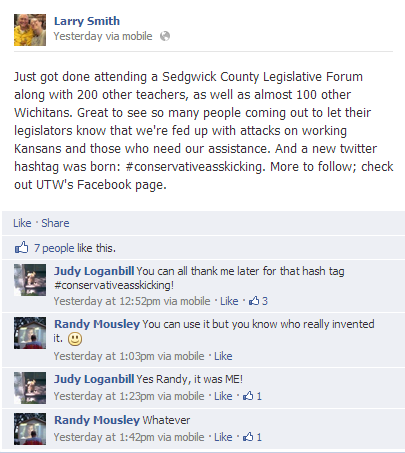 Randy Mousley is president of United Teachers of Wichita, the Wichita teachers union. Parents of Wichita schoolchildren might be interested in knowing which role he’s assuming when taking credit for his invention: Citizen, union leader, teacher, or something else? A dispute over teacher working conditions in USD 259, the Wichita public school district, provides a window into the workings of the public school system and its problems. There is a way out, but it’s not happening in Kansas. Public school teachers want to be recognized by the public as professionals. But when Wichita school district management seeks to actually manage teachers, the union intervenes, and change must be negotiated. This request was deemed “insulting” by United Teachers of Wichita, the union for Wichita public school teachers. Right away we can see some problems with public education, illustrated for all to see here in Wichita. First, why are the working conditions of Wichita schoolteachers a public matter? The answer is, of course, is that they are public employees, paid by tax dollars, and the public therefore has an interest and a right to know certain things. This interest — and controversy — was played out in some of the comments left to the online version of this story. Two controversial issues argued about include whether teachers are paid too little (or too much), and how many hours teachers work (or not). Both of these issues relate to professionalism. Most professional employees are paid based on performance or an agreement struck between the employee and management. That’s not the case in most public school systems, including Wichita. Here, teacher pay is based solely on two factors: longevity and education credentials earned. There is no opportunity for any teachers to earn more, no matter how they distinguish themselves. The reverse is true: the poor teachers earn the same as the outstanding. This lockstep pay scale is not characteristic of professional employees. Regarding how much teachers actually work, I’m sure some work long hours to complete their work. But the union contract for Wichita teachers is full of language like “The ending time of the school day in each building shall be seven (7) hours and ten (10) minutes after the beginning time” and “The teacher work day will be increased by forty (40) minutes one day per week for seventeen (17) weeks of the school year for PLC.” Again, union contract language like this is not characteristic of professional employees. But whether we call teachers “professional” or not is just a label. The real issue is that these issues are a matter for public discussion, and that they cause so much controversy and heated argument. This is characteristic of government institutions that have a monopoly or near-monopoly and are isolated from market competition. In Kansas, the public schools have a near-monopoly on the use of public funds for education. Unless a family wants to send their children to religious schools, not many have the financial resources to send their children to private schools. So we are left with a monolithic public school system, a system run by government. People are going to argue about how the system is run. People will resist paying for it. Some people will suffer the delusion that they can have an impact on the way the system is run, only to find out that the system protects itself very well. In many areas of human life, market competition has found to be the force that makes things better. Market competition doesn’t mean that people have to work harder and longer. Instead it means that there is a marketplace where consumers have a choice. It also means that people are free to enter the market as suppliers, as well as consumers. The term ‘capitalism’ refers not just to markets for the exchange of goods and services, which have existed since time immemorial, but to the system of innovation, wealth creation, and social change that has brought to billions of people prosperity that was unimaginable to earlier generations of human beings. Capitalism refers to a legal, social, economic, and cultural system that embraces equality of rights and ‘careers open to talent’ and that energizes decentralized innovation and processes of trial and error. … Capitalist culture celebrates the entrepreneur, the scientist, the risk-taker, the innovator, the creator. … Far from being an amoral arena for the clash of interests, as capitalism is often portrayed by those who seek to undermine or destroy it, capitalist interaction is highly structured by ethical norms and rules. Indeed, capitalism rests on a rejection of the ethics of loot and grab. … Capitalism puts human creativity to the service of humanity by respecting and encouraging entrepreneurial innovation, that elusive factor that explains the difference between the way we live now and how generation after generation after generation of our ancestors lived prior to the nineteenth century. We don’t experience the benefit of this in Kansas and Wichita public education. Except for religious schools and a handful of private schools that few can afford, education is provided by a government monopoly isolated from the creative and entrepreneurial impetus of markets. We don’t benefit from decentralized innovation. We don’t respect and encourage entrepreneurial innovation. Government programs don’t have these features. Paradoxically, while supporters of public education are likely to describe capitalism as an “amoral arena for the clash of interests,” we can see that the Wichita public school system is where the clash between management and workers is happening, played out in public. Instead of the education of children being the responsibility of parents and the concern of those they choose to voluntarily associate with, we have a government program. We fight over it. We destroy civil society, turning over something so vital and important to government bureaucrats and unions. 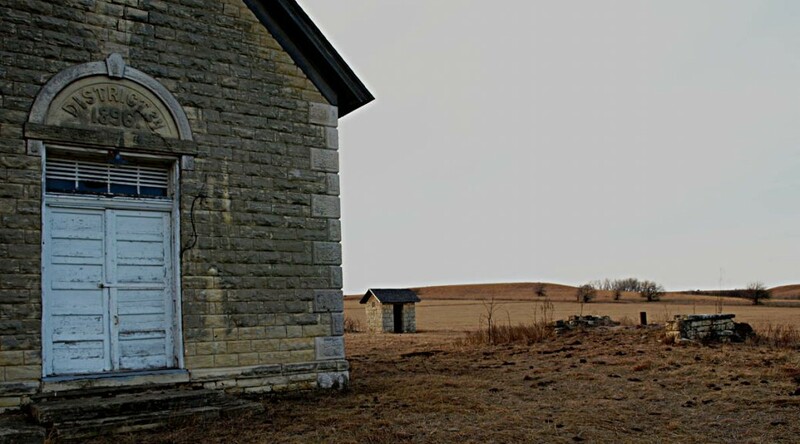 In Kansas, schools face very little market competition. The public school establishment vigorously beats back every attempt to introduce even small amounts of choice and competition. Instead we are left to fuss over phony reform measures such as Governor Sam Brownback’s current school reform proposal, which is really just small adjustments as to how the existing system will be paid for. The governor has yet to propose any meaningful reform. KRA guide to elected officials. The Kansas Republican Assembly has created a guide to Kansas elected officials. Besides contact information, it also holds things like committee membership for legislators. The links to the information are on the right side of KRA’s home page. Wichita Eagle voter guide. Click here. You can get a list of the candidates, along with their responses to questions, customized for your address. Campaign signs. The placement of political campaign signs can be an issue. Here is a City of Wichita letter describing placement rules, and a diagram. … If you live in a neighborhood with covenants prohibiting campaign signs, the covenants don’t apply at election time. See In Kansas, political signs are okay, despite covenants. Rasmussen polls last week. “Most voters continue to strongly favor repeal of the national health care law and they’re evenly divided as to whether the new law will force them to change insurance coverage.” Survey is here. … In a video Scott Rasmussen explains explains that 1954 was the last year that government spending declined from the previous year. Video is here, and an article is here. The article holds a chart that compares the difference between what government spending would be if it grew at the rate of population plus inflation, versus its actual growth. It’s a big difference. Organ recital tomorrow. On Tuesday (February 15) Wichita State University’s Lynne Davis presents a faculty organ recital. The event starts at 7:30 pm and has a small admission charge. The location is Wiedemann Recital Hall (map) on the campus of Wichita State University. For more about Davis and WSU’s Great Marcussen Organ, see my story from last year. Funny campaign stuff. Funny or sad, you decide. Proofreading always helps. A candidate for city council’s campaign website — right on the front page — reads: “The future of our great city rest in the voter’s hands, your hands.” Another page for this candidate states: “We must realize that things that use to work in our community, may no longer work.” … The Wichita Eagle voter guide has a spot for candidates to list their endorsements. Usually candidates would list prominent people or organizations that are supporting them. But one candidate used this opportunity to list a number of products that he recommends. What public sector union leaders think. Speaking of public sector unions, here’s a video featuring John Gage, who is president of American Federation of Government Employees, and what he thinks of those who want to control federal spending. It’s not complimentary. City council candidates to meet. This week’s (February 18) meeting of the Wichita Pachyderm Club features Wichita city council candidates from district 3. Scheduled to appear are James Clendenin, Clinton D. Coen, Mark S. Gietzen, and Hoyt Hillman. The public is welcome and encouraged to attend Wichita Pachyderm meetings. For more information click on Wichita Pachyderm Club. Politicians’ Top 10 Promises Gone Wrong. This Monday (February 14) Americans for Prosperity will show the 2010 John Stossel documentary “Politicians’ Top 10 Promises Gone Wrong.” For a preview and interview with Stossel, click here. For my reporting and review of the show, click on Stossel on politicians’ promises. … This event, sponsored by Americans for Prosperity, will be held on Monday, February 14 from 7:00 pm to 8:30 pm at the Lionel D. Alford Library located at 3447 S. Meridian in Wichita. The library is just north of the I-235 exit on Meridian. For more information on this event contact John Todd at [email protected] or 316-312-7335, or Susan Estes, AFP Field Director at [email protected] or 316-681-4415. This week’s meeting of the South-Central Kansas Legislative Delegation with citizens featured a number of speakers who — while citizens, of course — are working for taxpayer-funded agencies. Many of these also have a strong lobbying presence in Topeka. The large-scale presence of these speakers at this meeting was a matter of concern for one legislator who contacted me, suggesting that so many taxpayer-funded speakers crowded out regular citizens, which is who these meetings are designed for. Government agencies have their own meeting with legislators each year at this time in Wichita. Furthermore, many government agencies like USD 259, the Wichita public school district, have their own year-round, highly-paid lobbyists to represent them. The taxpayer-funded group that stood out the most was United Methodist Youthville, an agency that contracts with the state to provide a variety of child protective care services. Youthville sent six speakers to this meeting, and they, one after another in tag team fashion, presented their case to the legislators. One of the speakers for Youthville was Heather Morgan, who is listed at the Secretary of State’s office as a lobbyist for Youthville. Undoubtedly part of the reason for Youthville’s large presence was to counter criticism of their operations, which is often a topic at the legislative forums. The Youthville representatives, which spoke very near the start of the meeting, left as soon as they had delivered their message to the legislators. School spending advocates made their appearance. Randy Mousley, who is vice-president of United Teachers of Wichita (the teachers union), spoke in favor of more school spending — at least I think so, as his message to the legislators could be interpreted several ways. 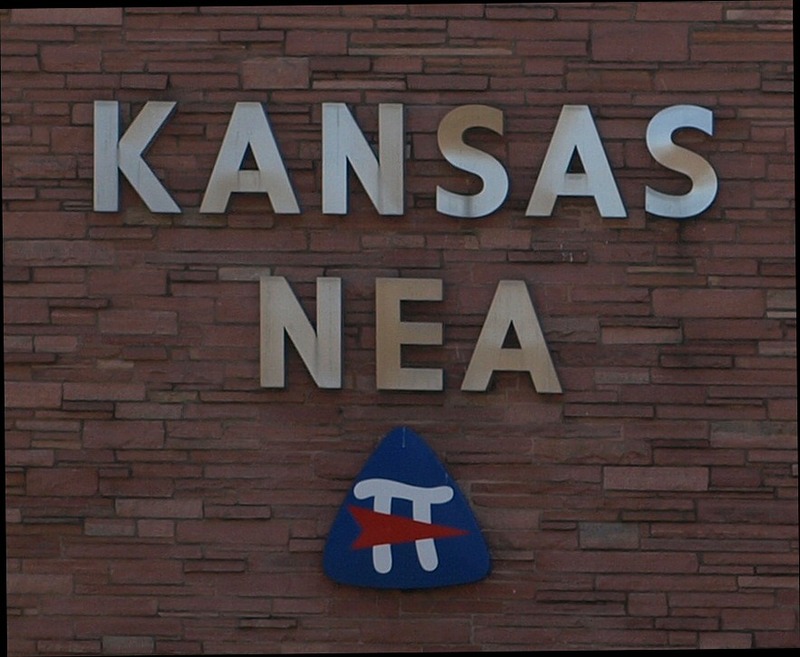 But the entire goal of the UTW, which is an affiliate of Kansas National Education Association (KNEA), is that there must be more spending on schools, and it lobbies for this quite effectively. Brent Lewis, a board member of UTW, also spoke in favor of government and school spending. Other taxpayer-funded entities made their appearance in the persons of Mark McCain, general manager of Wichita Public Radio, and Michele Gors, President of Kansas Public Television. These heads of these at least partially taxpayer-funded organizations made their case for more state government funding. These executives have the time and wherewithal to travel to Topeka to lobby legislators. Citizens — especially if they’re not local to Topeka — don’t have the ability to do this. And when they do, their travel is not paid for by their companies or unions. As legislators told me, these taxpayer-funded agencies make their case — often at taxpayer expense — very well in Topeka. They shouldn’t be crowding out citizens at legislative forums. Two weeks ago, while the Kansas Legislature was working on budget and tax issues, Larry Landwehr, president of United Teachers of Wichita, the union for Wichita public school teachers, addressed the board of USD 259, the Wichita public school district. Landwehr referred to “difficult decisions” the board had to make in the past few months, presumably due to budget cuts the district believed it needed to make. His remarks were based on a false premise, however. Many of these cuts were not necessary, as school districts have money to spend, if they want. During the present school year, according to figures released at the end of April, schools in Kansas were able to increase spending by an estimated $320 million. This was in spite of the fact that revenue to Kansas school districts declined by about $50 million. $370 million in fund balances were used to boost total spending by $320 million. These are the fund balances that school districts and school officials have said cannot be used. But districts have used them, and there’s more that can be used. There is no need to make cuts to teachers and programs. There’s a few issues here that deserve discussion. First, while the teachers union may believe that public schools in Kansas are producing a quality product, the rest of us need to dismiss this illusion. 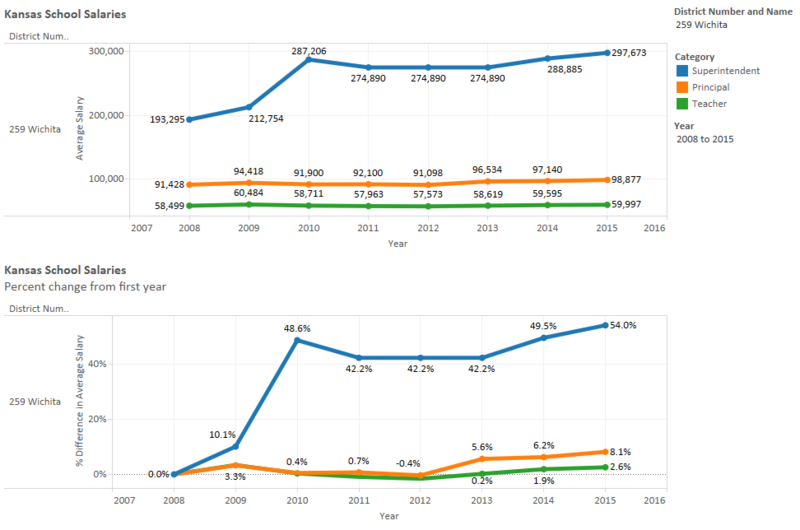 While Kansas reports rising test scores on state-administered assessments, these test scores are certainly fraudulent, as scores on tests the state does not control do not match this trend. Furthermore, only 26 percent of Kansas students that take the ACT test are ready for college-level coursework in all four areas that ACT considers. This is not a record of achievement that Wichita and Kansas school districts and teachers unions should be proud of. There’s also the issue as to whether Wichita school board meetings should be used for political campaigning. While Wichita public schools hate to be called “government schools,” the fact that this behavior is permitted at school board meetings show us that public schools are, in fact, creations of, and expressions of, government. At yesterday’s meeting of the board of USD 259, the Wichita public school district, members heard descriptions of district policy on how a reduction in force — layoffs, in other words — world be accomplished if the district decides to use this method of reconciling its budget. Several speakers, including superintendent John Allison, remarked how unfortunate it was that on a night the district recognized excellence in teaching, it also discussed methods of reducing the number of teachers. Board member Betty Arnold, now a candidate for the Sedgwick County Commission, said she was troubled by the possibility of laying off a promising first-year teacher when more senior teachers who might be on a disciplinary plan would be protected. Allison said that was the policy of the district’s contract with the teachers union, and a change would have to be negotiated. Allison said that new teachers who might be laid off might leave Kansas or the teaching profession altogether. This, combined with upcoming retirements, creates a “real problem for ourselves” far beyond the implications of this year and next year. A short-term budget issue can blossom into a long-term problem, he said. Government spending is paid for by the private sector, as government — at least the Wichita school district — has no way to create money of its own. Therefore, every dollar the school district spends is a dollar taken from the productive private sector. This leads to a reduction of economic activity and jobs in the private sector. Contrary to the argument of board member Rogers, government jobs like those in the Wichita public school system do not generate wealth or prosperity. Government spending also leads to a loss of economic freedom, as the ability of people to buy the goods and services they value is reduced by the spending of government. Consider especially the case of low and moderate income families struggling to pay private or religious school tuition for their children, and then being told they must pay even more taxes to feed the government school spending machine, something they personally have no use for. There may be those who think that government spending is more productive or efficient than private sector spending. This may be the case for a limited set of public goods. Education, however, is not such a good, as the private sector has a record of delivering education effectively and efficiently. Board member Arnold, in wondering out loud about the whereabouts of the government school district’s incentive, might choose to become aware of these facts: First, some of the incentives given to employers take the form of escape from paying some taxes. This is in recognition that taxes reduce economic activity. Regarding this, Arnold might want to recall that the school district is exempt from paying all or nearly all taxes. So there’s no taxes to abate with economic incentives. Second, granters of economic development incentives make the case that the new employment increases the prosperity of a region. There’s the possibility of that as long as the jobs being subsidized are private sector jobs. But when the jobs being subsidized are government jobs, no stimulative effect occurs. In fact, it is folly to say that it would be possible to provide an incentive to government jobs. Since they are totally paid for by taxpayers, there is no way to reduce the cost of government employees like private sector incentive programs are designed to do. Any reduction in employment cost would simply be born by the taxpayers who pay for cost of the incentives. Superintendent Allison’s concerns about a short-term budget problem causing long term problems should lead us to wonder why the district doesn’t make use of millions in fund balances the district holds. School spending advocates criticize those who advocate use of these fund balances by noting that the balances are not a long-term solution to school finance problems. That’s true. They are a short-term fix, which, as we now see, is what the superintendent says the district needs. Finally, we must note the irony of the Wichita school district building new schools and classrooms at the same time it can’t afford to keep the teachers it has. Larry Landwehr, president of United Teachers of Wichita, the union for Wichita public school teachers, recently addressed the board of USD 259, the Wichita public school district, regarding teacher morale and working conditions. Now that the district and the teachers union have reached an agreement on a contract, Landwehr said it’s time to look at other issues, those not part of the contract negotiations. He hopes for “serious discussion,” working to create an environment that is best for all stakeholders. Landwehr’s concerns over teacher morale and working conditions are not unique to the Wichita school district. Earlier this year the Friedman Foundation for Educational Choice published a study titled Free To Teach: What teachers say about teaching in public and private schools. This study revealed sharp differences in attitudes towards working conditions between public and private school teachers. Some of Landwher’s expressed concerns are mentioned in this document. In my coverage of the report I wondered this: Since nearly all public school teachers belong to a union and practically no private school teachers belong, what are the teachers unions doing? Don’t the unions care about the working conditions of their members? Landwehr’s message to the board is that working conditions are a concern to Wichita teachers. I’ll be surprised, however, if the union model of labor relations is able to provide a solution to this problem.